Update 2/13/2012: File-sending and app-sending is now fully functional. File receiving from the emulator is in progress. :: Client-side ROM and state storage to save bandwidth and solve the legal hurdles of an online emulator. :: Proper emulation of interrupts, flash, hardware quirks, LCD latency, and other attributes of the real hardware. 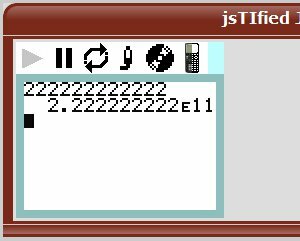 :: Integration into the SourceCoder online TI-BASIC IDE, including importing/exporting SourceCoder projects to/from jsTIfied. :: Loading files directly from the Cemetech/ticalc.org archives. I hope that you'll give jsTIfied a try as soon as possible, give me feedback (especially when run in browsers other than Firefox), and enjoy! Note: remember that distributing ROMs is illegal. Do not ask for or offer ROMs to any other members, on the forum or privately. I see it's inherited all the lovely quirks. O_o what does that do? So how's everyone doing with trying out jsTIfied? Thus far the only real complaints I heard, other than Weregoose pointing out that I had the [right] key mapped incorrectly, were problems using the wrong kinds of ROMs with it. It depends on both the browser and computer. On my laptop and desktop, it goes between 2x and 3x realtime in Firefox, except when cache flushes cause weird and annoying lag spikes. I haven't tested it extensively in other browsers yet. and I believe benryves also mentioned speed issues in Chrome? Would you be so kind as to test on the same computer in Firefox and/or Internet Explorer to see how it looks? Chrome is almost usable, Firefox is a definite no. Let me echo on the slowness in Firefox. It feels like I'm having to communicate with a server with each button press. It works with the ROMs that WabbitEmu generates. It's a little too slow to be usable, though, and the file loading isn't working. Seems to work well in Opera 11 on my Mac, other than some apparent conflicts with keybindings. Again, works super-fast in Firefox for me, even with my relatively weak tablet PC's specs and graphics. Yes Souvik, file loading is not yet implemented. elfprince13, what conflicts? Weregoose, do you have a billion tabs open? Any other browser do better for you, or you only use Fx? Ah, I see, file loading isn't implemented yet; I seem to have slipped over that part of the post. I'll try it in Firefox later to see if that improves the speed. Fn keys. [/quote] Weird, Firefox lets the page override the Fn key functions if it cares to catch them. 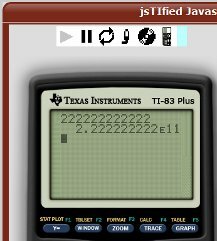 Google Chrome...jsTIfied seems to load the ROM file well, as well as play and pause, but the keypad and the load file buttons do nothing. 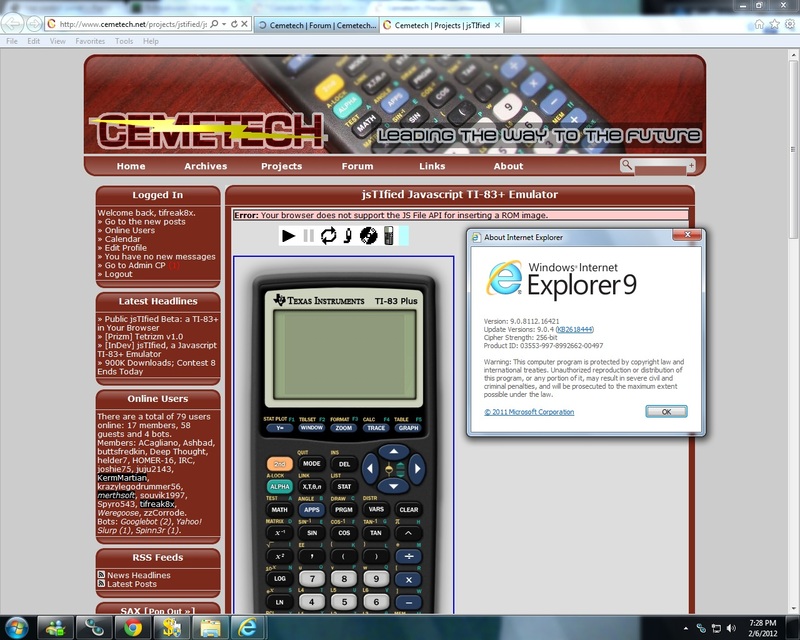 This doesn't work in IE8, I'mon my dad's computer so I have not tried it in chromium, opera, or firefox. It looks pretty good though. There are 296 users online: 11 members and 285 guests. © Copyright 2000-2019 Cemetech & Christopher Mitchell :: Page Execution Time: 0.181968 seconds.